Barking Rabbits: Do not pass Go, do not collect $200. 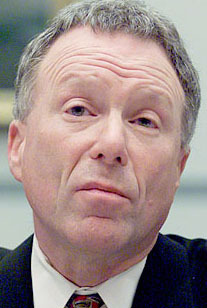 Scooter Libby must go directly to jail (in about four to six weeks, that is). All sorts of blogs and lesser news agencies are all over this story, so I won’t go into that here. All I will say is, hey, rich, powerful white-collar white guys who are convicted of pretty serious crimes do, on occasion, actually get sent to jail. Hooray for the rule of law. What I wanted to write about was that Judge Walton, who presided over this riveting case, has been the target of harassment and potentially threatening notes and e-mails. He also said he received several "angry, harassing, mean-spirited" letters and phone calls following his sentencing but said they wouldn't factor into his decision. I think I read where one such note was actually slipped underneath the door to his chambers while in court! What this quote doesn’t say is that Walton decided he better actually keep these messages, rather than toss them as he was originally doing, just in case someone actually does act upon these threats. There should be a record, he said. Now, why is this kind of behavior by right wing nut-jobs not a proper topic of national discourse? Lunatics who think they can storm Fort Dix disguised as pizza delivery guys and take out hundreds of very well armed and trained soldiers is a cause for the national media to go berserk, even though we later find out that these idiots had about zero chance of ever carrying through on their not-very-well-formulated plan. However, it somehow seems to be just fine that angry right wingers can threaten judges if they don’t produce results that the wingers agree with. You never see lefties threaten physical harm to those on the other side of the political spectrum. Sure, you see some very nasty comments on blogs and such, which I wish people would really tone down. But I don’t see anyone on the left really going to all the trouble to hand deliver a message, inside a crowded court house, to threaten a federal judge. Our run of the mill lefty whacko’s like to dress up like fish to protest loss of salmon spawning grounds. Worst case offenders on the left seem to be the animal protection activists, who do actual harm to buildings and property, which I am totally against. When one of those events happen, it is fairly well reported in the mainstream media. I am not sure where to put the people who travel around the globe and trash whatever city is hosting the World Trade Organization (WTO) conference. But I hardly ever hear of a specific person on the right being harmed, or even threatened with bodily harm, from someone on the left. Yet, here on a very high profile case involving a former high official in the Bush White House who was convicted of the crimes of which he was charged by 11* of his peers, some people think it is acceptable behavior to threaten the judge because they don’t like the outcome. I don’t know in what parallel-universe America that these people live in, but I wish they would wake up to the fact that, no matter what Ann Coulter or Michelle Malkin say, it is not acceptable to threaten people just because you don’t like the job they are doing! Man, I really hate this country sometimes. *For those not intimately familiar with the details of the trial of ol’ Scoots, one of the original 12 jurists was dismissed very late in the proceedings for being possibly tainted by exposure to news coverage of the trial. Against the wishes of the defense team (and little wonder there), the judge decided to, and the prosecution accept, proceeding with 11 jury members instead of attempting to bring a new alternate jury member up to speed on all the jury deliberations that had occurred to date. This is legal. You can’t start the proceedings with 11, but you can continue with less than 12 if certain conditions are met. Sort of like if most of the players on a basketball team foul out such that the team has to continue on with the game with only 4 players. Thus endeth my very elementary lesson in courtroom proceedings for today.